Dimple Haig is a deluxe blended scotch whisky, Its origins go back to the nineteenth century, but it was most popular in the 1960s. Ian Fleming, the creator of James Bond, had a keen eye for luxury products of the era and had Bond ordering Dimple Haig at Caracas Airport in Goldfinger (1959). The 1960s was the golden age of scotch whisky. Sales in the United States in particular were the best they had ever been and Europe was also getting a taste for scotch. Nearly all whisky sold in this era was blended. Most whiskies sold were 'standard' blends such as Bells, Teachers and the UK's number one selling brand until 1970, Haig Gold Label. However, at the top end of the market there were a few deluxe blends which sold in relatively small numbers, but had enviable reputations for smoothness and quality and their own loyal band of customers. Deluxe blends are made from thirty to forty different whiskies, with a larger proportion of malt to grain whisky than the standard whiskies. The whiskies from which they are made are also older. A whisky aged twelve years was the accepted standard in the 1960s. Whilst standard whiskies were fine as mixers, deluxe blends were often enjoyed on their own. There were many different deluxe brands, but Chivas Regal, Johnnie Walker Black Label and Haig Dimple had strong worldwide followings in the 1960s. There are marked similarities between these brands and their heritage. All three date from the late nineteenth century and in the 1960s all three blends had been around for more than sixty years without significant change. The Johnnie Walker blend is the oldest, dating from the 1860s, but the Black Label name was only used from 1909. Chivas Regal was launched in 1891 and Haig Dimple in 1890. All are blends of twelve year old malt and grain whiskies. All use thirty or more different whiskies, with Johnnie Walker Black Label being made from forty different whiskies. All had their own unique bottles and labels, and you can still buy all of these whiskies today. Haig Dimple had a particularly distinctive bottle. Its dimpled shape could make a perfect ship-in-the-bottle ornament. The bottle was covered with wire and labelled with what looked like ancient parchment. It hardly looked like a product of the era of modern design. In the 1960s blend was so well known that in 1962 two bottle nosed dolphins at Port Elisabeth Oceanarium were called Dimple and Haig. It was also a favourite duty free purchase for jet setting businessmen from the 1950s to the 1970s. Although the Dimple blend was first sold in 1890, early advertising refers to it as Haig Five Star Scotch. The bottle itself was designed by George Ogilvy Haig and dates from 1893. 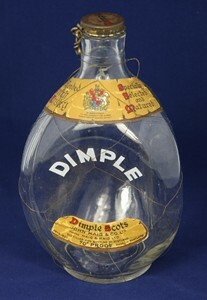 How Dimple was bottled before 1893 is not known. The Haig bottle was the first container to be registered as a trademark in the USA in 1955, beating the Coca-Cola bottle, which dates from 1915, by five years. Unlike many products today which hint at an ancient heritage, that of Dimple was a reasonably genuine claim. The Haig family, of which George Ogilvy and the World War One military leader, Earl Haig, were decedents had been involved in the whisky business since 1655. The present John Haig & Company was founded by John Haig, who started distilling whisky at Cameron Bridge in 1826. Blended whisky was produced from the second half of the nineteenth century. By chance scotch was to poised to become the world's favourite tipple. French Brandy, the most popular spirit in the polite circles of Victorian England suffered a devastating blow when the phylloxera aphid wiped out nearly half of the French crop in the 1870s. Whisky, and blended whisky in particular, filled the void. The John Haig & Company prospered and had ambitions to take the brand further. John Alicious Haig founded Haig & Haig with the aim of exporting whisky to the USA. Haig & Haig is the brand the Americans know. They exported whisky to the USA from 1888 until Prohibition in 1920 and resumed again after the eighteenth amendment in 1933. Haig's export trade with the USA brought it notoriety in 1941 when the SS Politician carrying two thousand cases of Haig & Haig whisky, both Gold Label and Dimple, bound for the United States, was wrecked off the Isle of Eriskay in the Outer Hebrides. It inspired the novel by Compton Mackenzie, 'Whisky Galore' as well as the 1949 Ealing comedy of the same name; although the ship became the 'Cabinet Minister' in the film. Haig & Haig introduced the 'Pinch' name in the US market in 1951, because American's had been using the name 'Pinch' for many years before then. The whisky remained 'Dimple' in the UK. How did Dimple fall from grace? Haig lost its market share in the UK for its regular brand, Gold Label, throughout most of the 1970s. First Teacher's and then Bell's became Britain's best selling whisky. Dimple disappeared entirely from the UK market in 1977 after a dispute with the European Community over dual pricing in UK and European markets. It continued to sell in export markets. However, the rise of single malts as luxury whiskies saw its share of the market crumble. Dimple did eventually return to the UK market, but its sales are nothing like those of its glory days. We are not after value,but a clue about age.The gold mesh is still on. Would like some help if possible.